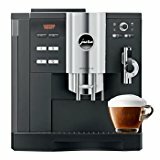 Currently viewing the category: "Jura Espresso Machines"
Jura GIGA 5 vs. Z9, What’s The Difference And Where To Buy Them? 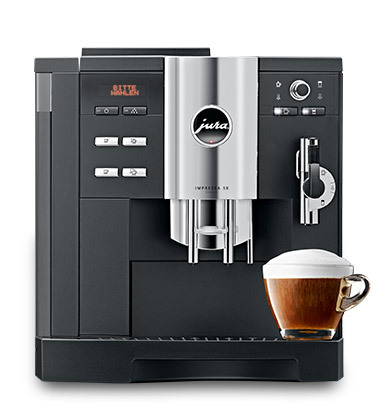 It’s no secret that we’re big fans of Jura’s superautomatic espresso machines. 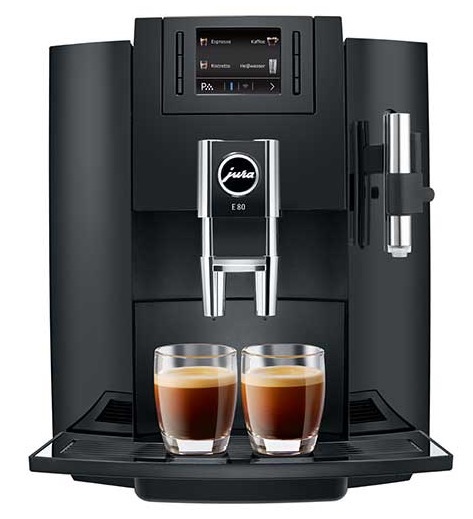 Leaders in their domain, Jura make the best coffee machines that do it all with a push of a button. Our post here is dedicated to two of Jura’s high-end models: Jura Giga 5 and Jura Z9 Impressa. These two machines are equipped with great technology and design, and they do come with a hefty price tag, but don’t let that scare you just yet, because we’ll also tell you how you can buy them for an insanely discounted price! 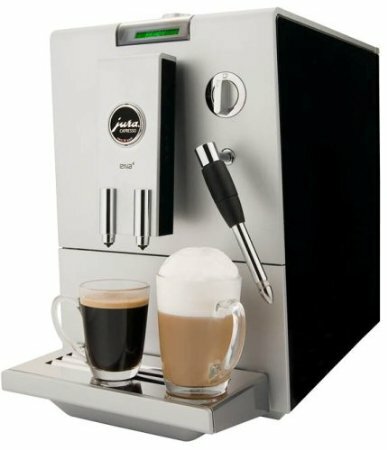 Two built-in grinders and Two heating systems, this machine allows you to prepare one or two specialty drinks at the same time. Double grinders and the machine also allow you to blend two kinds of coffee (from each hopper) in a single drink. Ceramic burr grinders that don’t produce heat and are whisper-quiet. 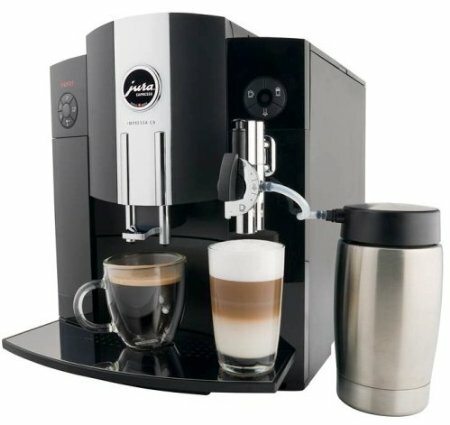 Dual spout dispenses the liquid into the cup and can be height & width adjusted. From 2.75″ to 6.25″ high and from .78″ to 2″ wide. 18 Programmable specialty coffee drinks. Creating your drink is super easy thanks to the colored screen display and rotary selector. Programmable strength, grind and temperature. Automatic milk frothing and dispensing. Bypass doser allows you to use ground coffee instead of using the grinders. 9 oz bean hopper for each grinder. 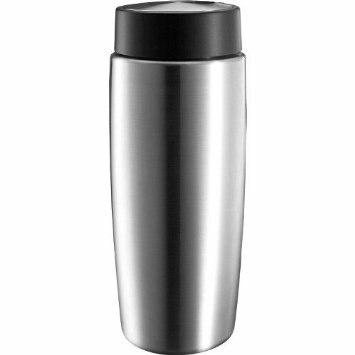 20 oz thermal milk container. Makes a single drink at a time. Two heating systems, one for coffee and another for steam. Color screen display for easy programmability of your coffee. Ability to use pre-ground coffee instead of grinder. 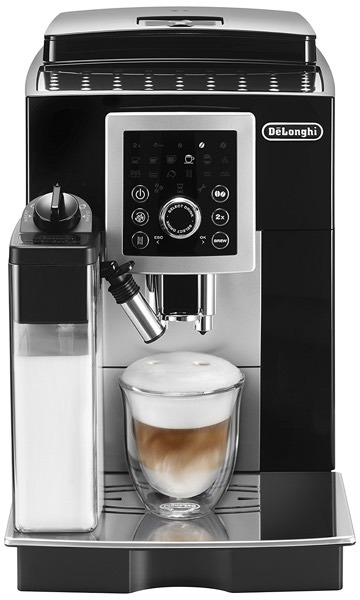 Programmable coffee strength, grind settings and temperature. What Is The Difference Between Jura GIGA 5 vs. Z9 Impressa? 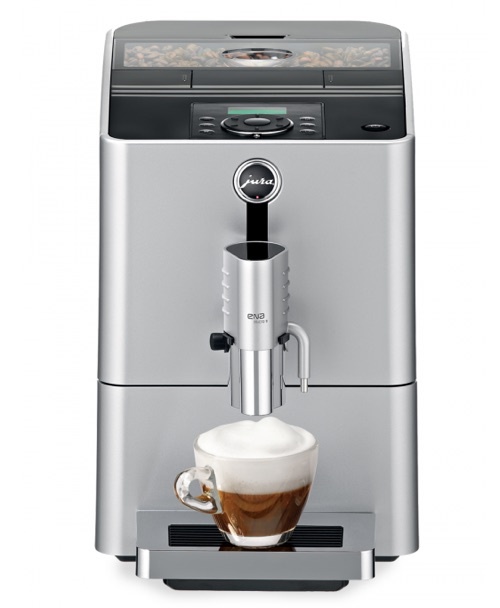 The GIGA 5 has TWO grinders and TWO heating systems. 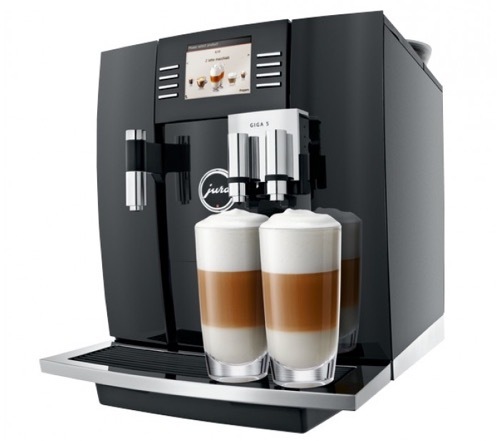 This means you can prepare either one or two coffee drinks at the same time without the need to wait. This is a rather useful feature if the machine is going to be used by a lot of people (say in an office, or in a large family), where you may need to process two drinks at the same time. But that’s not the only thing. Another great feature is that the JURA Giga 5 allows you to create a mixed coffee blend from each hopper. Say for example you have one hopper that has regular beans and the other is filled with decaf, you can program your machine to create a half-caff drink by grinding coffee from each hopper in one drink. The GIGA 5 and Z9 have the same TFT color screen that shows you a clear menu of the drinks available with a photo. You can use the same screen to select your customization like temperature, strength or volume. It’s very simple to use. One small difference is the water reservoir capacity: The Z9 has a larger 96 oz capacity while the GIGA 5 has 87 oz. The bean hopper capacities are the same, although on the GIGA 5 you get two bean hoppers of course. 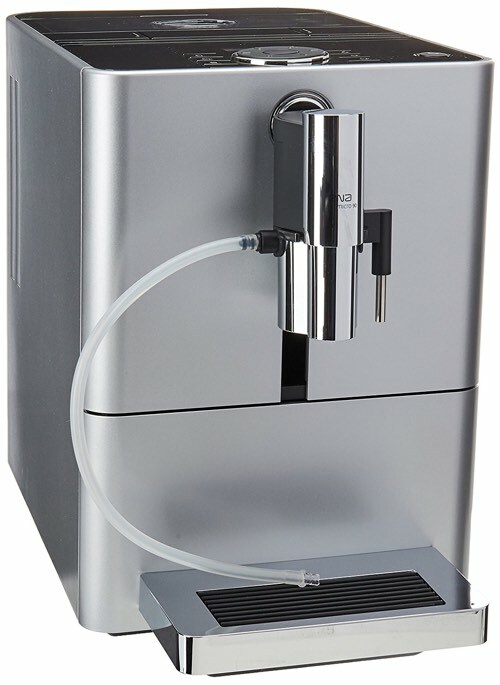 Also included with both machines is a 20 oz thermal milk container that allows the machine to automatically froth and dispense milk. 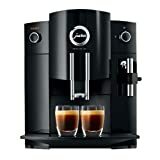 How To Save On Your JURA Coffee Machine Purchase? Like we said at the beginning of this post, Jura machines come with a rather hefty price tag. With their technology, design and well manufacturing (They’re made in Switzerland! ), they’re very much worth their price. But you still don’t have to pay full price for them. How? By buying a factory refurbished machine instead. If you choose to buy a refurbished JURA machine, you are guaranteed a clean and like-new machine and you can save hundreds or thousands of dollars (yes, you read that right, thousands!). 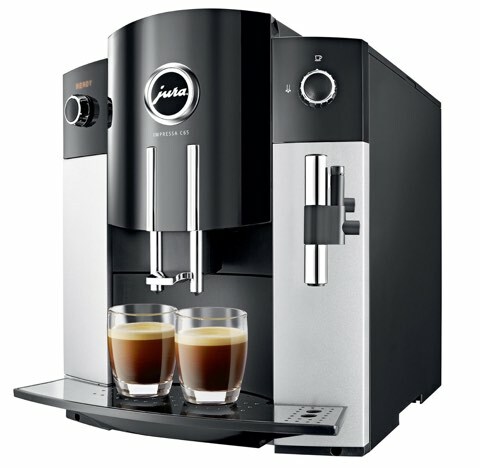 Where To Buy a Refurbished JURA Machine? 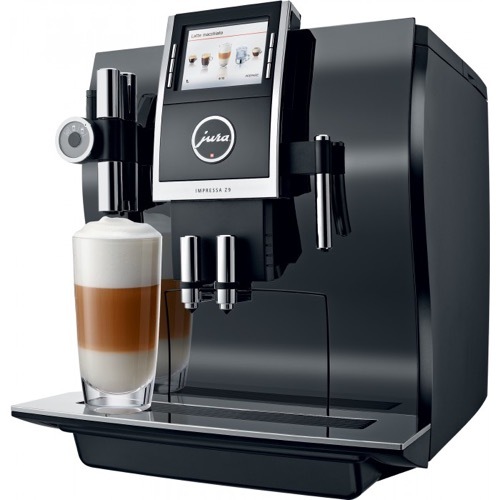 Our favorite retailer for refurbished JURAs is 1inCoffee.com, all their JURA line is guaranteed factory refurbished, have been tested to be in perfect working condition and come with a 1-year warranty. You also get FREE shipping on your order. 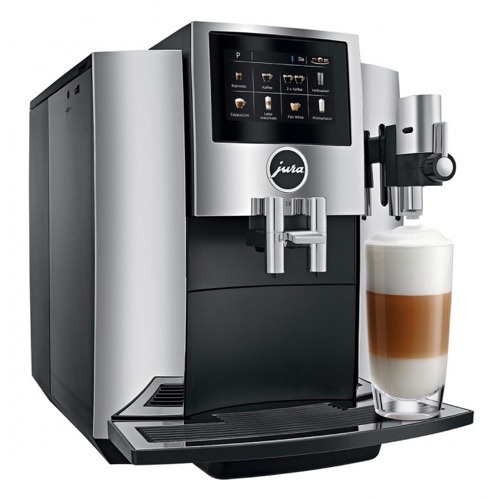 Prefer to buy your JURA brand-new? 1stInCoffee has new Jura machines, too. Check them out here. 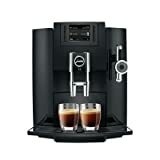 Where To Buy a Refurbished Jura ENA 9 One-Touch? 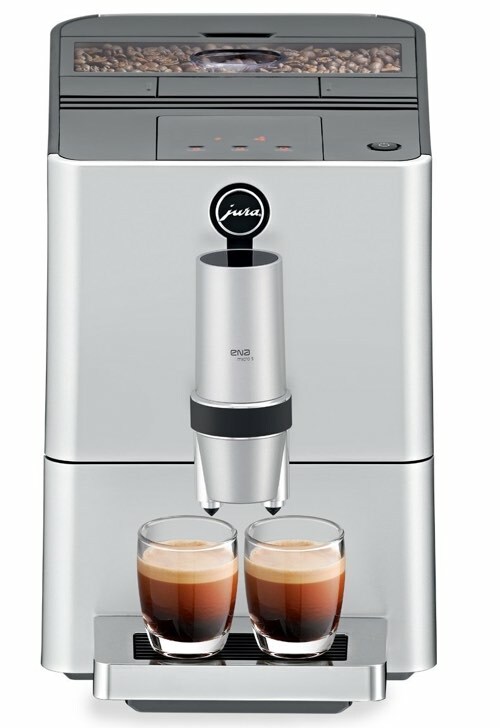 Swiss brand JURA makes high-end superautomatic espresso makers that every coffee lovers dreams of having at home. 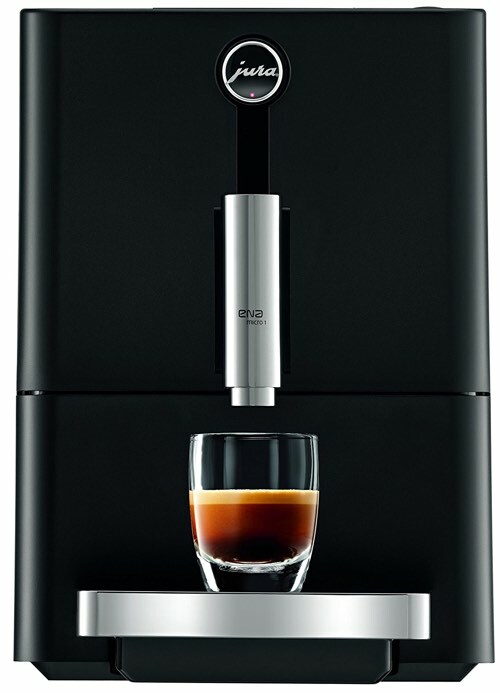 The Jura ENA 9 is the slimmest super-automatic made by Jura, it gives you a wide range of freshly brewed specialty coffee drinks with a touch of a button. 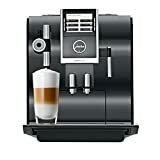 The machine does it all, from grinding, to coffee brewing and milk frothing, all you have to do is push a button! Why Buy a Refurbished Jura? You might be wondering why we’re writing specifically about a refurbished Jura. Why not buy new? And is it safe to buy a refurbished machine? Well, we realize that many people dream of having a Jura at home, but Jura’s coffee systems happen to be at the high end when it comes to price. The machines are certainly worth it, but unfortunately, not everyone can afford to buy a brand-new Jura. That’s where a refurbished machine makes a very smart option. 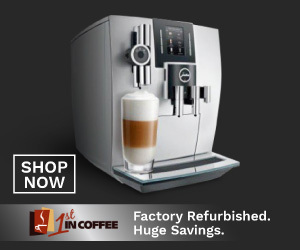 You can get a refurbished, new-like Jura machine with savings up to %50 OFF! That, right away, makes it a much more affordable option for many people. The machines are factory serviced in the Jura USA Facility and come with a 1 year warranty. Why Choose the ENA 9 One-Touch? 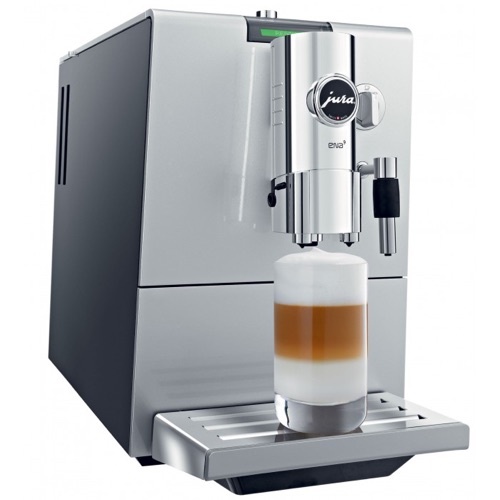 Jura has a wide range of excellent espresso machines, but the ENA 9 One Touch has to be our favorite for many reasons you’ll learn about in this post. Less than 9 1/2 Inch wide, making it the slimmest of its kind. Built-in conical burr grinder with 5 adjustable grind settings. 7 oz bean hopper capacity. 37 oz removable water tank. Bypass doser for using coffee ground, in case you wish to use coffee other than the one in the hopper. One-touch milk frothing for creating specialty coffee drinks. Height adjustable coffee spout allows you to adjust according to your cup’s height to eliminate splashing. 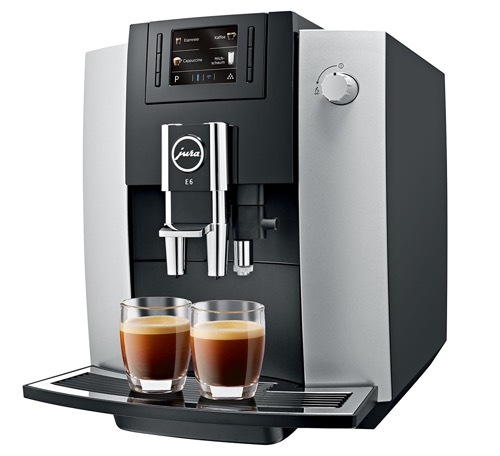 Fully programmable cup sizes, coffee volume and temperature settings. Aroma Boost setting for giving you an extra kick and taking the strength of your coffee up a notch. LCD screen display with color changing light to indicate status of the machine: Green = ready, Red = requires action or Yellow = Programming mode. Rotary dial allows you to choose and reprogram your settings. 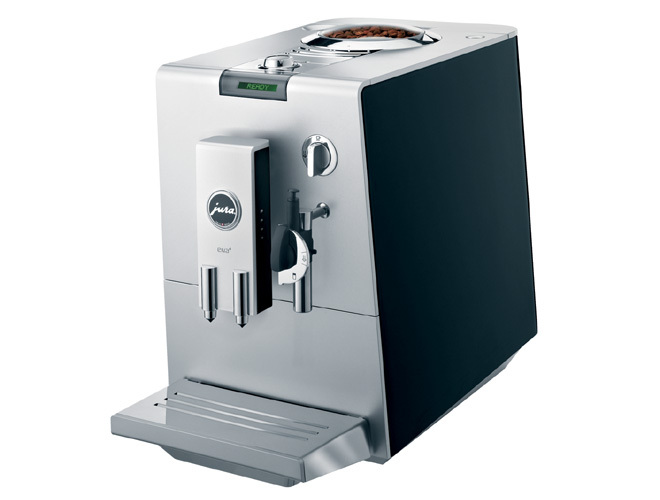 Click here to learn more about the Jura ENA 9, read the customer reviews and buy it (REFURBISHED). Want to buy it new? Click here! Jura ENA 9 vs. ENA Micro 9, What’s The Difference? Even slimmer than the ENA 9 at less than 9″ wide. Redesigned control panel with all touch buttons. Bean hopper capacity is 4.4 oz. Everything else is pretty similar to the ENA 9. You get the same quality of coffee with simple one-touch system. Click here to learn more about the Jura ENA Micro 9, read the customer reviews and buy it (REFURBISHED). Want to buy it new? Click here! 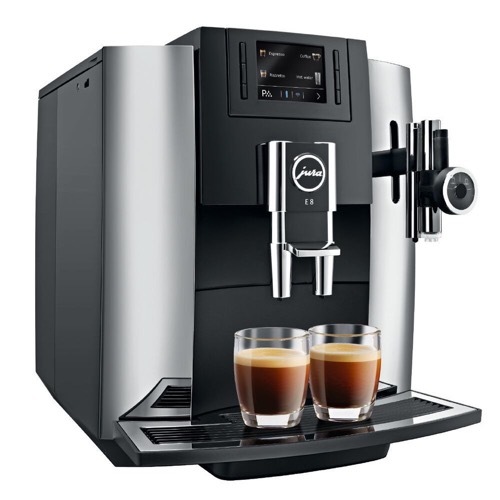 What’s The Downside of a Jura Espresso Machine? We already said that Jura has the best super automatic espresso machine out there. But, there’s one downside to it that I personally don’t like. If you happened to be a fan of cappuccinos or lattes, then you’ll definitely need frothed milk. 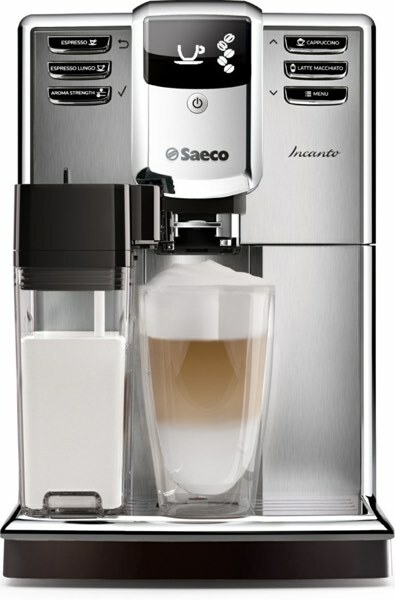 The machine does automatically froth milk for you, but that milk has to be drawn using a milk container. Your Jura machine will include a ‘hose’ of sort that you’ll attach to your machine and then put in your container of choice. Jura does have milk containers, but they’re sold separately, and that’s exactly what I don’t like. For a machine of Jura’s class, you’d hope that the milk container was included with your purchase. However, you can still use your own container. It doesn’t matter which coffee drink you want to wake up to in the morning, enjoy in the afternoon or serve your friends and family after a nice meal. The Impressa J6 does it ALL, and it does it with a touch of a button! 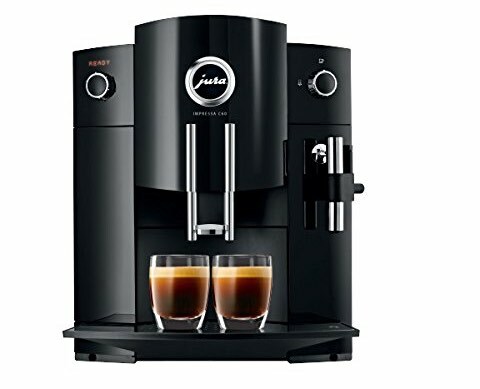 A truly impressive piece of machine, striking polished black design, and use friendly – this is what you need in your super-automatic espresso machine. Built-in conical burr coffee grinder, it grinds tamps and brews coffee all under 60 seconds. 450-watt stainless-steel-lined Thermoblock system. 15 bar pressure pump. 6 grind settings from coarse to fine. 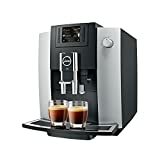 Built-in milk frother, automatic or manual. 6 pre-set drink options – all can be reprogrammed by you. LED display for easy controls and use. A generous 71 oz removable water tank. Measurement: 16-1/2 by 11 by 13-1/4 inches. The buttons on the front panel of the machine make using it a breeze. You simply have to push a button to get the drink you want! The dual nozzle can make you a single or dual shot at the same time. And with the control buttons, you can adjust the water volume, the coarseness of the grind, the taste strength and much more. It’s YOUR coffee, YOUR way. And since the machine will be setting on your counter-top for long years to come, the fact that it has a beautiful modern design is a huge plus. It’s a great machine to keep on display and on stand by. 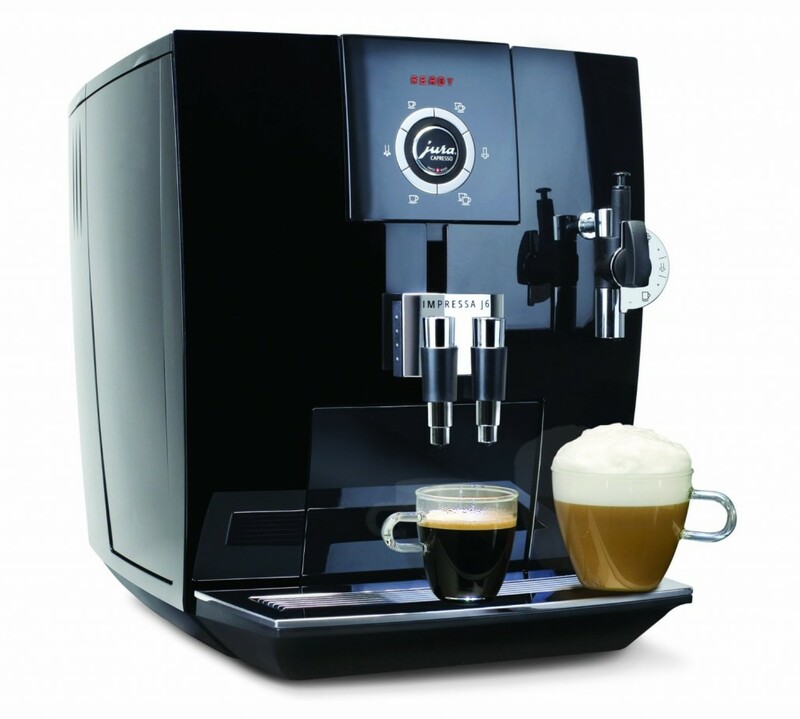 Want to learn more about the Jura-Capresso Impressa J6, and read customer reviews? Click here. 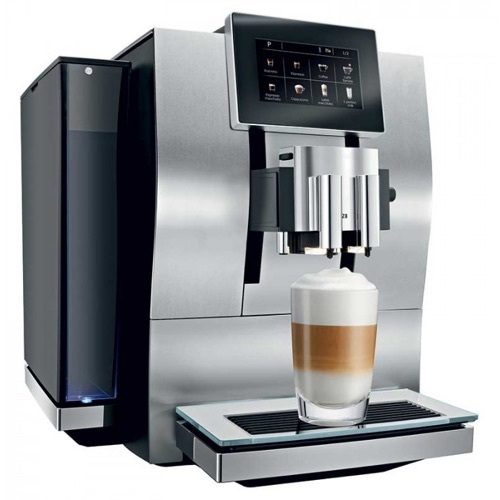 Pre-programmed + programmable buttons for coffee, espresso, cappuccino, milk or hot water. Two temperature settings, three strength levels, and volume options: one or two cups at a time, from 1 to a full 16 ounces. 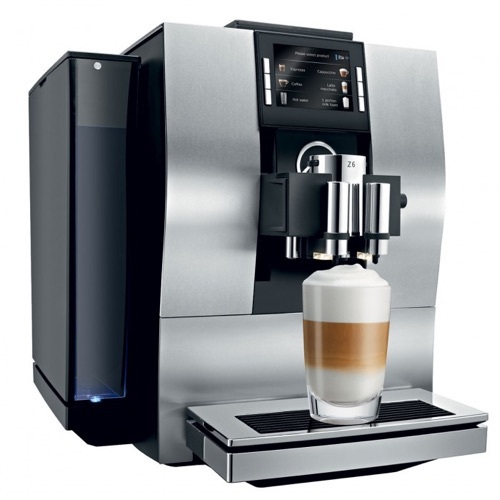 frothXpress Plus system automatically froths or steams milk. Built-in conical burr grinder with 6 different settings and available funnel for pre-ground coffee. 64 ounce removable water tank, 8 ounce bean hopper and 14 ounce thermal milk container. 18 bar pump, Thermoblock heating system. 1450 watt power. LED display, easy to use buttons and control panel. 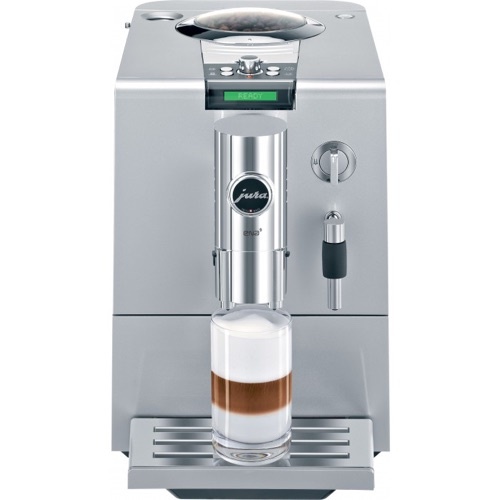 The Jura Impressa C9 One Touch is a very simple machine to use. Once you’ve set it up, it’s all push-button from there. But in case you do need help, the included DVD will explain everything for you with clear instructions on how to brew coffee, froth milk, and how to clean and maintain the machine. If you’re still not quite convinced this the right machine for you, click here to see reviews from customer who have already purchased and used the machine.